The 10-kilometre race is the headline event. 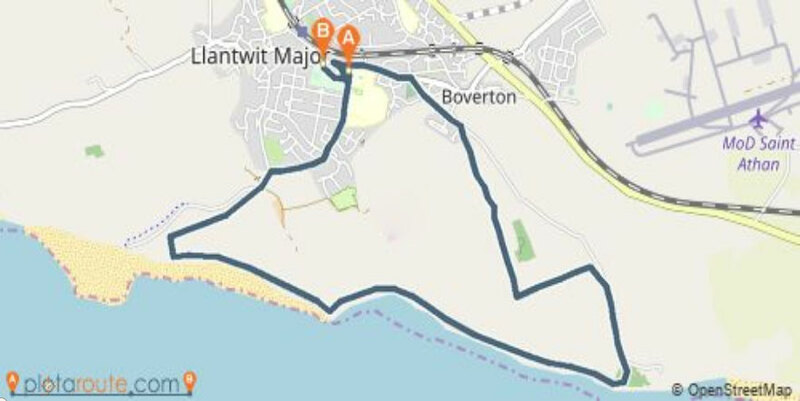 Starting near the centre of the historic town of Llantwit Major the route includes a very fast downhill start which takes competitors off tarmac within 1500 meters when they leave the road and enter the nature reserve. The course remains off road for the majority of the distance, through ancient woodland, public footpaths and farm lanes, taking in the Glamorgan Heritage Coast from Castle Ditches to Summerhouse Point with stunning cliff top views across the Bristol Channel to Somerset, Devon, and inland across the beautiful Vale of Glamorgan. Turning back inland past the second water stop there is a tantalising glimpse across country of the finish line, still 3 kilometers away. The race remains almost entirely off road until the last 600 meters when a shallow but challenging gradient back towards the town tests the front-runners tactical abilities. A sharp turn into the rugby club fields and less than 200 meters to the finish beneath the western rugby posts. An opportunity for a sprint finish and a welcome drink. The 1k race is intended for children and those who don't feel confident enough to run the full 10k. The route is entirely within the confines of the rugby club field for a safe, traffic free route. Adults running the race will have missed the point if they win the race and cross the line with arms raised like Mo Farah.